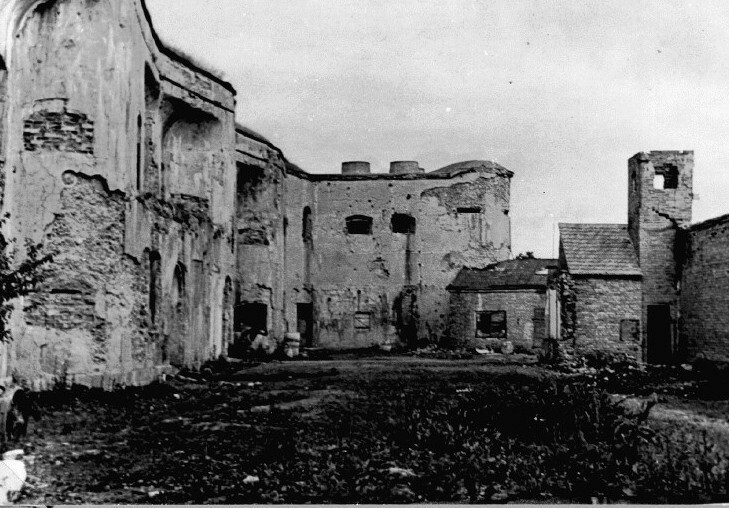 When the fugitives from the 9th fort were being sent from the ghetto to join the partisans no news were available about the groups which had left previously. Nobody knew if they had succeeded in getting to their destination and joining the partisans. The first greeting from them was received through a trusted man in the city: he received a double-meaning letter. Several days later, on January 11,1944 Nechemiia Endlin, Sara Rubinson, Boruch Lopiansky and Zundl Strom returned to the ghetto from a partisan base. They were sent as guides for the new groups. From that day on former ghetto organization members accompanied all groups leaving for the forest. Nechemiia Endlin gained his popularity as a guide in a short period of time. He accompanied several groups to the partisans; each group contained more than thirty people. 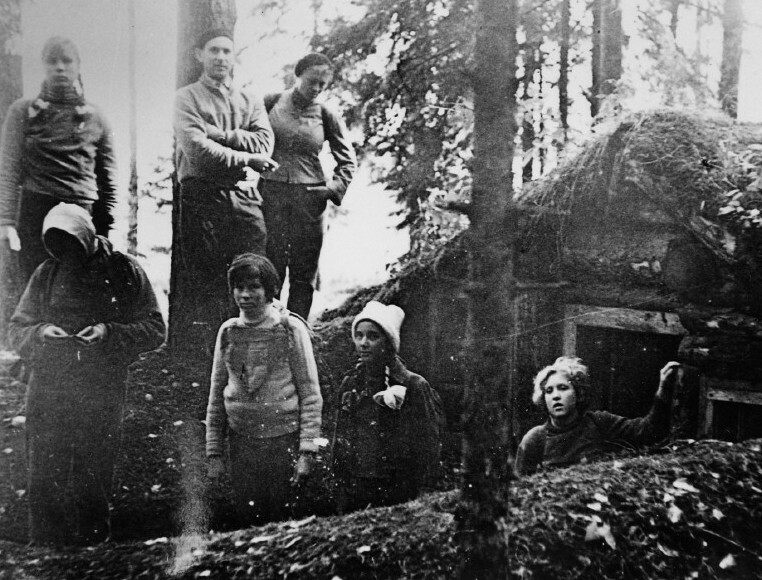 In January-February 1944 groups heading for Rudnizky forest were accompanied by Boruch Lopiansky, Israel Goldblat, Shmuel Martkovsky, Sara Rubinson, Zundl Strom, Hona Kogan and others. The guides established a reliable link between partisan groups and the ghetto. Apart from the ghetto groups the guides also took groups of underground fighters from the city. 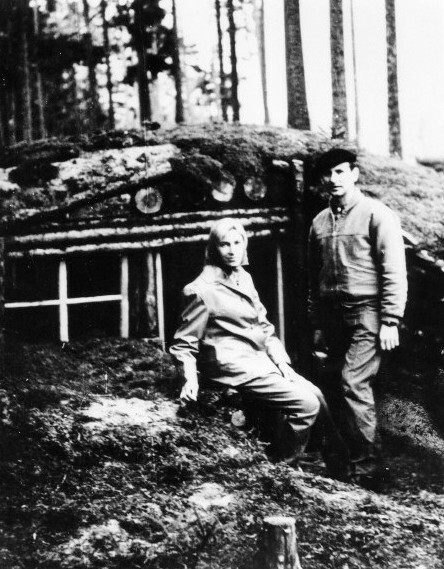 Shmuel Martkovsky and Israel Joels brought Albina to Rudnizky forest. Shortly after Haim Yelin went there with Kovno underground party committee member Grigory Krugliakov. They needed to discuss problems of sending armed fighters from Kovno to Rudnizky forest. Nechemiia Endlin accompanied them on the way back. Valia Pushaite (Anele Zinkiavichute) responsible for the work of city komsomol members came with them. At the partisan base Haim Yelin was confirmed as a member of Kovno underground party committee. This lead to closer cooperation between city and ghetto organizations. City underground fighters helped the ghetto organization as much as they could. Piotr Trofimov set up a secret weapon depot at 53,Jonavas street (* now Itzik Meskup street), where ghetto fighters hid ammunition. 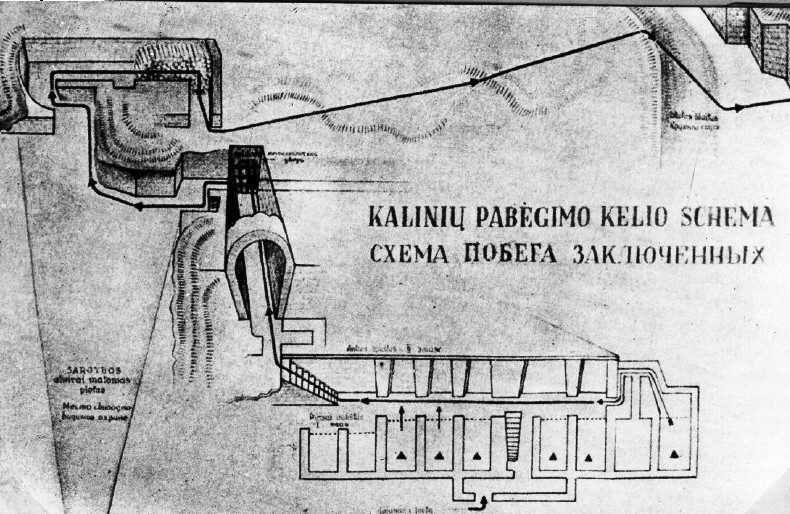 At comrade "Olia"'s near the ghetto (16,Puodjiu street) and at 8,Italiios street (*now Mazkiavichus street) permanent safe houses were set up for the fighters who were preparing to go to the forest. In their turn ghetto fighters took part in the work of the city organization. A special task group was sent from "Death to Invaders" group to Kovno. On most occasions the ghetto organization got in contact with them and helped all they could. For example, at the end of February 1944 three partisans (Sofronii Orlov, Itzik Boruch, Tevie Pilovnik) got into the ghetto while carrying out some special task in the city. The organization put them in its bunkers, gave them new clothes and ammunition and sent them to the partisan base with their own group in a lorry. At the beginning of 1944 the anti-fascist movement in Kovno suburb of Murava was struck a serious blow. Germans arrested the leaders of the movement and the relatives of those who left to join partisans and other residents of Murava. 40 people were killed. Among the dead was Yegupla Radionov, the father of Konstantin Radionov, leader of partisan group "Death to Invaders". 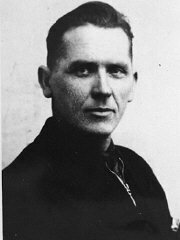 Among those arrested was Kulvinskas ("Romka"), one of the movement leaders. He found an opportunity to send a letter to his friends from the prison before his death. In it he wrote, "We were tortured but we have not given in. We know we will die. Carry on fight until a complete victory!" The ghetto organization lost its important support in its work. Partisans coming from the forest could no longer use Murava base and had to seek shelter in the ghetto. Weapons! Weapons! this call became the main call to the ghetto fighters. The more weapons there were , the more fighters could leave the ghetto and join the partisans. The condition requiring every partisan to be armed was severe but necessary. It was inadmissible to burden the detachment's situation by bringing in unarmed people. The organization carried out a number of operations to acquire weapons. One of them was undertaken in January 1944 at the German hospital warehouse situated at 28,Vitautas street (*now Lenin avenue). Ghetto Jews were brought there to perform various menial tasks. The organization sent its members there to make a detailed plan of the area and to study local regulations. Sonia Rubinson found a key to fit the warehouse door. At the stipulated evening Itzik Miklishansky, Mendl Moshkovich and Gegujhinsky got over ghetto fence and went to the city. They hid in the cemetery adjacent to the hospital and waited for the city life to die down. In the darkness, dressed in white camouflage coats, unnoticed by the guards they started their approach. With the fitted key the underground fighters opened the warehouse doors and brought out three sacks with rifles and bullets. In the morning, at the arranged hour a lorry arrived (the driver was one of the fighters) to take hidden sacks to the secret depot in the city. The second successful operation took place in the workshop armoury of the German anti-aircraft defence forces. A Jewish brigade from a camp in Aleksotas was sent to the workshop. The underground fighters from the camp came with a solution how to acquire weapons from there but could not do this on their own. The ghetto organization was informed of this by comrade Benzl Preis. He also passed on the fitted key to the armoury. At night "experts" left the ghetto to carry out the operation: Jankel Levi, Mendl Moshkovich, Itzik Miklishansky. They got to the guarded area, reached the chambers and took all weapons and arms they could find there. Then like in the previous case they took these finding by lorry to the secret place in the city. These successful operations allowed the organization to send more and bigger groups of over thirty persons each from the ghetto in February and March 1944. Guided groups were taken by lorries 70-80 kilometres from Kovno. The partisans were excellently armed. For example, the group which left the ghetto on March 3 was armed with three submachine-guns with a lot of ammunition, three machine-guns and nineteen rifles, 4,500 bullets, numerous revolvers and hand grenades. Black clouds were gathering over Kovno ghetto. The number of the ghetto residents was going down. Death was hiding round the corner. The children's action was a tragic reminder: the days of the condemned were numbered. Spring evening of 1942.People began returning to the ghetto from work. Women and children rushed towards the ghetto gates to meet relatives. As always they looked forward to the return of the workers: it was not unusual for some not to return from "work"... The roar of a motorcycle engine broke the deafening silence. Just in case people began hiding. Children were seized with an instinctive fear. Like frightened little animals they helplessly clung to grown-ups looking for cover... The motorcycle roar was a familiar sound to everyone - it meant the arrival of Ernst Shtiz, gestapo representative for "Jewish affairs" in Kovno. He was coming to meet his assistant Lipzer, a Jew. From the very first days of its existence the ghetto organization began explaining to all its members and via them to the rest of the ghetto population that children faced real danger in the ghetto, and that they had to do all possible to hide their children with non-Jews. The organization formed a group of women who were responsible for finding accommodation outside the ghetto for the children, teaching them Lithuanian, acquiring necessary documentation and other things. Members of the organization - Ronia Rosental, Ida Shater, Sheina Berelovich-Hodes and many others - had to leave the ghetto on many occasions in search of sanctuary for the Jewish children. Great wit and heroism were shown when children were taken outside the ghetto. Three-year-old Tamara Ratner was put asleep with an injection of luminal to ensure she did not make a sound. Ida Shater together with the child's father took the living parcel over the ghetto fence and left on the doorstep of Lithuanian children's home "Lopshialis". The home's director Baublis was informed beforehand on such occasions. His trusted teachers expected children and took them into the home as "deserted children". Six-year-old Liolia Rosental was taken out of the ghetto by her father in a sack. With this parcel on his back he walked for eight kilometres. In the village of Rojay farmer Maziasuskas took the boy. Lithuanian writer Kazis Binkis who died unable to bear the new regime, did not simply hid Jewish children herself but also made it her aim to save as many of them as possible. She, her daughters Lilia and Irene travelled tirelessly around the area looking for places for Jewish children. Thanks to their efforts children of engineer Per, Margarita Stender,daughter of murdered leader of the Lithuanian state opera orchestra, Gita Judelevich, Kama Gink, Esia Goldstein, daughter of partisan Bobiansky and many more others. Worker Maria Mazinavichiene saved eleven-year-old Aleks Strom and seven-year-old Aviva Friedman. 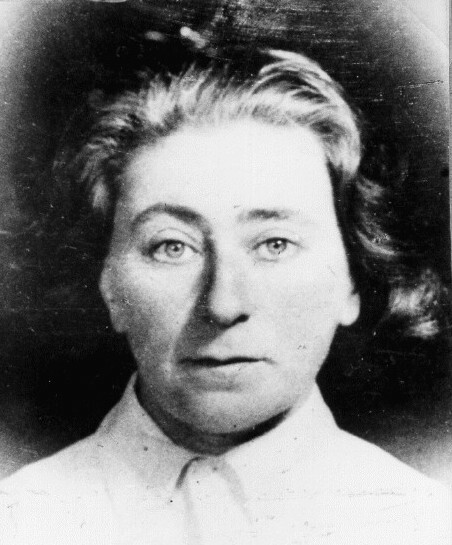 Real tragedy befell teacher Helena Golzman in the first days of the occupation: her Jewish husband was murdered so was her elder daughter, a komsomol member. But the woman did not lose her courage. Throughout the occupation she was helping Jews. Several dozen Jewish children and teenagers stayed with her while safe homes were sought for them. Dozens of other Jewish children owe their lives to Natasha Pigalevich, Tamara Likiavichiene, Nataly Melioranskaia-Egorova, Lithuanian writer Sofia Churlioniene and her daughter Danute (* wife and daughter of famous Lithuanian artist Churlionis), engineer Zubov, worker Julia Dautartiene, academician and professor Pranas Majhilius, people's artiste of Lithuania Kipras Petrauskas, violin player Vladas Varchikas and many others, who risked their lives and lives of their families in the name of humanity and brotherhood between people. Saving a Jewish child's life from executioner's hands - this was also struggle! Middle-aged worker Agrippina Lepetucha who hid two-year old Aliosha Aleksandrovich was forced to leave Kovno in a hurry as she was suspected of hiding a Jewish child. With this child she changed many places going from one Kovno village to another until the Red Army arrived. Lithuanian woman Chijauskiene was shot dead at the ghetto gates when she tried to take a Jewish child out. Teacher Liuzia Doniene hid daughter of engineer Jacob Rabinovich. Gestapo learned about this, arrested the woman, took away and then murdered the girl. Fascists tortured Chijauskiene for a long time trying to establish who were the girl's parents and how the girl disappeared from the ghetto. The courageous woman did not utter a word. She was saved from a certain death by the arrival of the Soviet Army. Over four hundred Jewish children were by various means taken out of the ghetto and then given to private individuals or Kovno children's homes. Even Kitel, newly appointed Gestapo representative for "Jewish affairs", refined sadist Kitel, suddenly performed "an act of good will" - some Jewish children found by the Gestapo in the city were returned to a children's home in the Jewish hospital. The majority of the Jews, however, did not consider such "favour" to be a good sign. Indeed, soon after March 27, 1944 the most terrible event of all events that had happened in Kovno ghetto took place. After the work brigades were taken out for forced labour the ghetto was surrounded by reinforced guards. Soon lorries full of Gestapo guards moved into the ghetto. A car with a loudspeaker was cruising the ghetto; people were warned to stay indoors - he who dared to come out would be shot. Jewish police ordered to gather for a fire drill were surrounded by SS tommy-gunners. -Enough! You won't have a chance to fool Germans any more!- Kitel declared and ordered Jewish police to get into armoured buses. Policeman Levner who refused to obey the order was shot on the spot. Three heavily guarded armoured buses with the Jewish policemen went towards the 9th fort. Some policemen tried to jump off the vehicles on the move but were caught by machinegun fire. Mothers who refused to let their children go were badgered with German shepherds. To muffle the terrible screams Germans turned on very loud dance and march music and broadcasted it through the loudspeakers on the lorries. Children were hidden in and under beds. Some had suffocated as a result of that. One woman from Lutaro street had no place to hide her child. She did the following: wrapped up her child in a tablecloth, tied it up and hung it up on a nail. - When Germans come I shall be quiet - the four-year-old child promised his mother. The child kept quiet even after one of the Germans pushed the parcel and asked what was in it. The boy was saved. The round-up lasted until evening. Around nine hundred children, old and sick people and invalids were put into lorries and driven under guard to the west. As it became known later the people were taken to Auschwitz where gas chambers and crematorium awaited the unfortunate. But those figures did not add up. From the available to them data Germans knew that a large number of old people and children had not been found yet. The next day round-ups had resumed. Every suspicious place was carefully searched, hand grenades were thrown into basements and lofts. All newly discovered people were put into lorries and sent to the 9th fort. In spite of all brutality Germans managed to find only a smaller number of victims the next day - just about two hundred people were caught. Everyone noticed that Lipzer, gestapo representative in the ghetto, was also taken to the 9th fort during the action. Several hours later he returned to the ghetto. He told one person (Lipzer thought that he enjoyed the confidence of the underground fighters) that some of the Jewish policemen betrayed names of the resistance fighters to the Germans. But as it was discovered later those names were betrayed by Lipzer himself: this fascist lackey served two masters. The organization managed to hide their members before the Gestapo came looking for them. -Now you will have to answer my questions: who belongs to a "terrorist group" in the ghetto, where do they hide weapons, where are the secret bunkers, who keeps gold and money in the ghetto, who killed "my Fain"?.. He who does not reply will burn like Levin!.. For three nights and days, threatening people with death and terrible torture Kitel tried to get some information about the underground resistance movement in the ghetto. Thirty six Jewish policemen including all their bosses were shot. Members of the Council of Elders were also interrogated in the 9th fort. But Kitel failed to uncover the ghetto organization, he failed to get any information at all. The organization refused to come out into an open struggle - after the departure of the recent group to the forest there were very few weapons left in the ghetto for them to resist properly. Under the influence of the events in the ghetto the organization took special measures in order to send to the forest new groups of people. As early as the third day Haim Yelin succeeded in finding some vehicles to send a new group to the partisan base. Because of increased terror one could not hope to leave through the ghetto gates. People had to leave one by one by climbing over the well-guarded fence. Four people died while trying to get through. 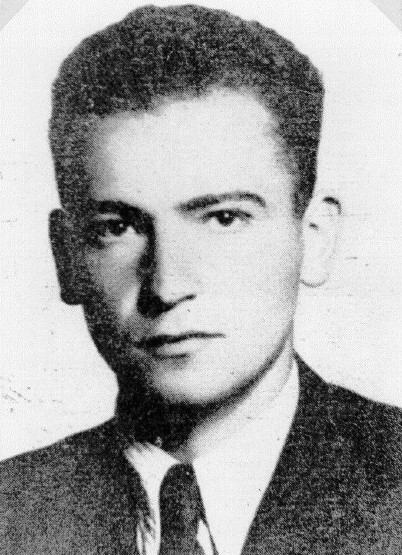 In the group leaving for the partisan base in Rudnizky forest were Alta Teper, member of the ghetto committee, Jankel Levi, messenger for the ghetto-city connection, and also brave weapon supplier Itzik Miklishansky, experienced messenger Sulamif Lerman and other activists. Nechemia Endlin and Borech Lopiansky acted as their guides. Kitel would not let up. What he could not get during the "children's action", he was determined to get through his daily activities. Kitel himself, untersharfuerers Pilgram, Fiviger, Auer with their assistants spent all their time in the ghetto. They blew up basements ( every building containing a basement was decorated with the word "bunker") and all the time they were hoping to find where the underground leadership were hiding and where weapon depots were. There was no Jewish police any longer. A part of the police force returned from the 9th fort Kitel made an obedient instrument - so called "law and order services". The essence of this new "institution" became clear when one learned about traitor Lipzer's appointment as its head, his assistant became infamous hooligan from Jewish police Arnshtam (*after the war T.Arnshtam was severely punished by the Soviet court). As a result the ghetto organization took more measures to secure their own safety, went deeper underground and continued its work. Simultaneously gestapo increased their terror in Kovno while sending thousands of people to forced labour in Germany. Fascist administration persecuted people after a slight suspicion of sympathy for the ever growing resistance movement. During arrests and expulsions the city underground organization also lost some of its members. In spite of all dangers Haim Yelin stayed in the city. He sent a letter to his friends in the ghetto which he finished with the following words: "We need strong nerves! Tell our fellow-fighters that I shall stay in Kovno irrespective of dangers until the last of our comrades leaves the ghetto..." Haim Yelin with the help from city party comrades and, in particular, comrade Trofimov tried to get more weapons and transport to send new groups to the forest. He reported that on April 5 a new group was to leave Kovno. Future partisans were to meet in designated areas. Guarding of the ghetto fence was increased. Newly fledged members of the "law and order services" were devoted to their masters: they watched carefully to avoid mix-ups at the gates. It became impossible for people to pass through the gates unless they were members of work brigades. At the same time it became impossible to leave work or to slip out of a guarded column. There was one armed guard for each 7-8 Jews. Nevertheless, the organization managed to take out about 40 members thanks to slack guarding of the ghetto fence near the cemetery and the nearby saw-mill. The authors of this book were in that group too. All gathered in safe houses. Over 20 Jews, who had left the ghetto and in the process taken remaining weapons of the organization, came to the house of one Russian woman "Olia" at 18,Puogiu street. But the vehicle which was to take them to the forest failed to arrive at the agreed time. Haim Yelin learned: the driver was arrested. The situation became critical. People had to disperse to various lofts and basements in the ruins of the former parts of the ghetto. Round-ups in the city followed one another. It was impossible to march to the partisan base because of well-guarded roads in Kovno area, insufficient weapons and guides. Haim Yelin tried to find transport. He arranged meeting with another driver for Thursday, April 6. But the gestapo had traced one of Kovno underground fighters; they were looking for a young man of medium height, wearing a sheepskin coat and twisting moustache, in a porter's or railway-man's peak-cup whose nick-name was "Vladas" - gestapo was looking for Haim Yelin. Haim Yelin arrived at the agreed time to meet the driver. Suddenly he was approached by a gestapo agent from behind,"Hands up!". Yelin managed to wrestle a revolver from the gestapo agent's hands. They started shooting. Yelin succeeded in wounding the gestapo man's hand and then he got to another street by jumping over a fence in the neighbouring garden. However, having heard shooting policemen and soldiers came running from different directions; they began chasing Yelin. Having run through two blocks Yelin understood that all escape routes were cut off, he then turned into a familiar court-yard which to another one. Haim Yelin's tragic death was a real blow to the ghetto organization: he was more than a simple leader and co-founder of the organization; he also carried out the most difficult, demanding and dangerous tasks. He volunteered, frequently against the warnings of his friends, to perform most important and life-threatening tasks. Optimism, closeness to people, cordiality - typical of Haim Yelin's character - ensured that people who dealt personally with him liked him. Everyone saw him as a friend and devoted comrade ready to help anyone. Yelin took participation, varied in its significance in the organizational work or helped with his practical advice. He composed texts of leaflets, instructions, appeals, headed the task of writing a military programme for the organization. Haim Yelin participated in military training, taught other fighters shooting. In the autumn of 1943 Haim Yelin was wounded but in spite of that he kept his contacts with partisans in Rudnizky forest, ensured availability of transport and guided groups to partisan bases. As well as major tasks Yelin performed, what at first glance seemed to be, insignificant work. A few days before his death, feeling danger looming over him he carried a machine-gun wrapped in a bag through Kovno streets. Haim Yelin knew it would allow yet another fighter to reach his aim - leave for the forest and partisans. By the decree of the Presidium of the USSR Supreme Soviet of 2 July 1945 Haim Yelin was posthumously awarded the Order of the Great Patriotic War of the First Degree, for his services in setting up partisan movement in Kovno ghetto and his heroism in the fight against fascist invaders.